You might recognize this picture. I included it in my vacation post on Monday. Several people wrote in, hoping that I might post the recipe. I’m happy to do so, though I must confess that it’s barely a recipe at all. I have a basic formula I follow for quick, refrigerator-type pickles like this. It’s one cup vinegar (any 5% acidity vinegar will do), one cup water and one tablespoon pickling salt (sea salt is also fine). This is typically enough for a quart of pickles, which a little bit leftover. It can be expanded or contracted as needed. Spices can be anything you like. For this particular batch of pickles, I used a generous tablespoon of pickling spice. Depending on what you’re pickling, you can add garlic, peppercorns, red chili flakes, dill seed, mustard seed, etc. After you pour the brine over the veg, place a lid on the jar and let is sit on the counter until it’s cool. Once it’s returned to room temperature, pop the jar into the fridge and let it sit for at least 48 hours before proceeding to munch. I have never seen those pickled, what a good idea. Wouldn’t they be great on a relish tray with the olives, baby pickles, etc….. Thanks for sharing this! These are about the cutest pickles I have ever seen. I grow patty pan squash but never thought to pickle them. Thanks for sharing. These are so cute. I hope you let some of those pattypans grow up. They are incredibly delicious when stuffed and baked!!! I use the squash I scoop out, plus herbed bread stuffing and bulk sausage or just cooked hamburger. Sooo… good. Patricia, I bought them like this at Lancaster’s Central Market. I hear you on the pattypan love though. My parents always grow them in their garden and I grew up eating them lightly steamed, with butter and salt. So good. I marinate them in olive oil with garlic scapes and other herbs and then grill them on the BBQ. Mr. Ivriniel isn’t big on vegetables, but he likes these. These darn baby pattypans are so cute! I want to grow them just to have them 🙂 I have never even tasted one before! I’m planning on doing some fridge pickled beets this weekend- any recommendations on par-boiling them (should I and if so, for how long?) and what kind of spices would work well? Thanks very much for the advice!!! I made a similar pickle using the Persian Tarragon pickle recipe from “Canning for a New Generation.” I have high hopes for tasting them on 9/12. And here I thought I’d had an original idea! As they say, there aren’t really any original ideas under the sun! 😉 I hope your pickles are delicious! could you slice the bigger pattypan squash and pickle them? Wonderful idea – I have so many on my allotment in the UK I can’t keep up with eating them and giving them to friends, so this is great idea. Do you just use the patty pans raw or do you need to blanch them before pickling at all? Thanks. Do you have a suggestion for making a cupboard long store version? I would love to be able to have these year round. I grow zillions of pattypan every year. Pack ’em in pint jars and process in a BWB for ten minutes. 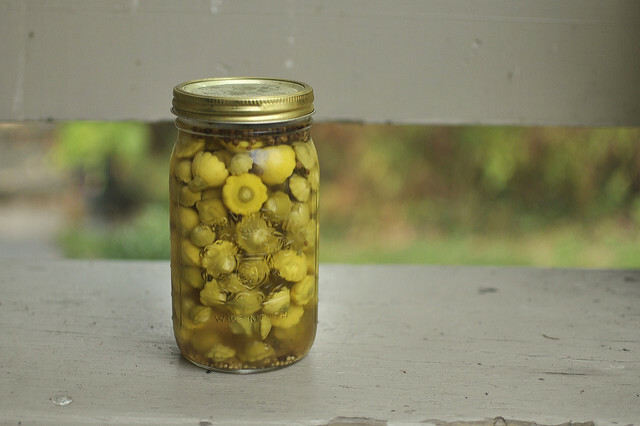 You can really treat them just like a dilly bean or other preserved pickle. I like the idea of pickling Baby Pattypan, or Pattypan if I can’t find their adorable babies! Can’t wait to taste the pattypan squash, added a few to the quick pickle recipe and loved them. I also tried some radishes that are white or red on the outside and have a lovely pink blush in the center when peeled. They turned out great. Wondering how rosemary sprigs would taste added to the pickling liquid. Rosemary would probably be delicious! Where can I purchase patty pan squash already pickled? There is a line of Polish-made pickled vegetables sold under the name Belveder. 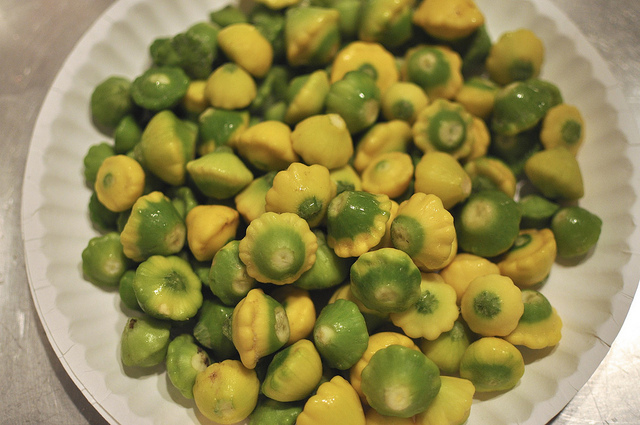 They sell a SUPER DELICIOUS pickled baby pattypan squash–so good I can eat them by the jarful! I don’t know of any other way to get them than through an importer. I can’t vouch for RussianFoodUSA personally, but now that I have found them, I am going to order at least 1/2 dozen jars. The shipping seems reasonable, but I am on the East coast.